The Catch has built its entire foundation on plot so far. “The Trial” is an especially plot-heavy episode, with the investigators working on a medical malpractice case and the con persons furthering their mission to steal a bunch of money from the princess and her guard Qasim, who throws a bit of a wrench in their plans when he sees that “Michael Thorn”—Ben’s latest identity—is very clearly up to no good. Every beat in both of the two plots running through “The Trial” are pretty easy to see coming. It isn’t until they finally intersect and Alice has Ben in her crosshairs again when things finally get interesting. Alice’s pursuit of Ben remains on the backburner for much of the episode, as she becomes distracted by the case of the week, which just so happens to bring in Val’s ex Gordon (Alan Ruck) and his sister Susan (Amanda Forman). Susan suffers from multiple sclerosis and a clinical trial she was in ended up landing her and several others patients in the ICU. Alice and Val are tasked with proving the drug company lied about previous trials in order to convince participants to sign their contracts. On a certain level, the case works thematically within the context of the episode, which keeps returning to the idea of being too close to a job. But Gordon’s sudden presence in Val’s life actually doesn’t unearth all that much other than some extra exposition. We learn a little more about how their marriage ended, and it also provides another excuse for flashbacks. At first, the flashbacks seemed unnecessary yet again, but later on in the episode, some meaning is ascribed to them, which I’ll get to later. Ultimately, Val still doesn’t get all that much play in this episode, even though it seemed initially like the plot might address what it feels like or means to work in a professional context with an ex. But one thing that has remained consistent on The Catch is that the writers only really seem concerned with developing emotional storylines for Alice and Ben. Obviously, tracking down Ben is very personal for Alice. “The Trial” haphazardly lets us know that Agent Dao, too, has a personal reason for catching Ben, who he thinks killed someone he cared about. But the show is still lacking in character development for anyone who isn’t Alice and Ben at this point, so it doesn’t come as much of a surprise that their scenes are the most compelling to watch. Ben’s first phone call to Alice in the restaurant is way more thrilling than Margot shooting Qasim in the head. I wrote in my review of the pilot that The Catch should be more of a revenge story than a love story, and yet in spite of myself, I found myself thinking that the best scene of the episode was the phone conversation between Alice and Ben at the end, when they’re both in bed. It’s one of the only scenes in the episode where there are things left unsaid. There’s tension. There’s subtext. There are layers of emotion. Val and Alice’s scenes where it’s just the two of them have that more natural and emotional feel to them, too. Every other piece of dialogue uttered on this show just drips with exposition. And its in the phone conversation between Alice and Ben that the real meaning of the flashbacks surfaces: Alice sees the part of Ben that actually cares about other people. Getting Susan a job had nothing to do with the con. It’s not enough to make her suddenly want to give up on finding and destroying him. And let’s be real, it would be supremely dumb for Alice to realize that she still loves him based on that and that alone. But the fact that Ben did make certain choices when she was his mark that had nothing to do with the con itself suggests a much more complicated picture of his motivations. Maybe she was so easily played by someone not because he was necessarily a master player but because there were moments that were real. It would have been much tougher to spot Ben’s deception if he was starting to actually care. But then the phone conversation ends with Alice, who is usually quite levelheaded, whispering to herself like an unhinged person. Again, the dialogue can really be quite abysmal on this show. It needs more of those quieter, emotionally driven scenes that really get into the characters’ heads instead of just advancing the plot. Cons, chases, and cases are fun, but they need to mean something or at least have detailed, compelling characters carrying them out. 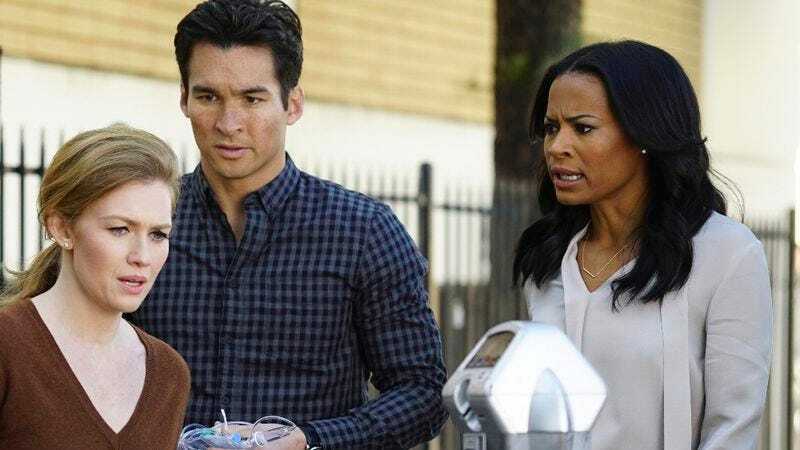 Right now, The Catch seems to be mechanically going through the motions of its stories without much attention to detail and without anything to really give the show a distinct voice. The story needs to be more about just Alice and Ben, because every week there are extra plots going on that have nothing to do with the catch. They shouldn’t feel like distractions. This episode featured a mini-Parenthood reunion between Forman and Peter Krause. Forman played a character named Suze on Parenthood, and Val actually referred to her as Suze here. As atrocious and heavy-handed as the script often is for this show, sometimes an actor will churn out terrific delivery, like when Sonya Walger says “Neither of you is running point. I’m running point” and “He was going to kill you and expose us and he wasn’t a very nice man.” She’s managing to bring a lot of personality to a character that we know next to nothing about. I’m enjoying Medalion Rahimi’s spirited performance as the princess. My favorite Mireille Enos look this week was that navy tanktop.